France is the land of wine but it’s not necessarily something of adulation. I was told the average price spent on a bottle of wine in France is €3,20, which means a lot of people are spending less than that. To many, it’s just a drink and not something that’s considered a special-occasion beverage. And while people scoff at things like boxed wine, or wine in bulk, locals who live near wineries in the countryside of France often buy their wine that way because it’s more écolo (ecological)…and cheaper. The French are a thrifty lot, and don’t like to throw things away. And neither do I. I wanted to have a sidewalk sale to get rid of a few odds and ends and was told it was interdit (forbidden). So I assume that, like me, everyone’s apartments are stuffed with things they can’t, or won’t, get rid of. 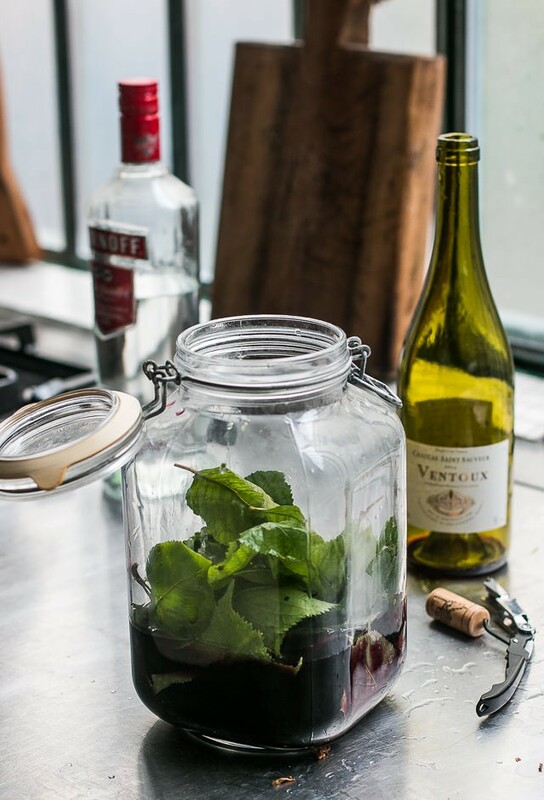 I save old cutting boards, linen kitchen towels, slightly battered (but beautiful and well-used) kitchen knives, vintage gratin dishes, and wine bottles and carafes to bottle up and serve various homemade libations, such as this Cherry Leaf Wine. When I was at my friend’s house outside of Paris recently, because I’m also thrifty (radin), I stripped branches of bay leaves off their trees, picked as much sage and rosemary as I could before they got suspicious that I was starting my own herb business (although not on the sidewalk…), and grabbed a bagful of cherry leaves from their trees that were ripe with fresh cherries. Once home, I jarred them up with some of that cheap red wine. I’ll confess that the wine I used cost even less than €3,20 – I think it clocked in at €2,90, and it worked just fine, along with a good pour of vodka, some sugar, and a few black peppercorns, for adding a bit of a spicy note. I’ve taken some flak for putting ice in wine, which they routinely do in hot climates like Provence and Corsica, places where wine isn’t always considered an upscale drink. And it’s simply too hot to drink anything, wine included, unless it’s very chilled. A lovely young Frenchwoman came to one of my events in Paris and said, “Of course we put ice in wine in the south. You must in the summer. It’s called a plouf” – presumably because it makes a little splash (plouf) when you drop it in the glass. In Corsica, even the red wine that was poured around our dining table was watered down with sparkling water and a few ice cubes ploufing around in the glasses. And if you want to argue with Corsicans, be my guest. If you have access to a cherry tree, and you’re un peu radin (cheap), like I am, you can easily make a batch of vin de cerise. There’s no law (as long as you’re not selling on the sidewalk, at least) that says you can’t flavor it with a few cracked apricot or cherry kernels, a couple of cracked allspice berries, star anise, some lemon peel, or just make it as suggested with the peppercorns. The time to make this is when, or after, the cherries on the tree have ripened. You’ll need to make sure the tree hasn’t been sprayed with anything, and unlike recipes that say, “Use a wine that you’d like to drink,” for this, use a cheap red wine. A Frenchman said to me once, “Use the worst wine you can find” when we were making apéritif wines in his kitchen. And there’s no shame in that. So feel free to walk out of the wine store, jug (or box) in hand, and make a batch of this apéritif maison (homemade wine). It’s deeply satisfying to sip something you’ve made yourself, although beware that because it’s fortified, it packs quite a punch. 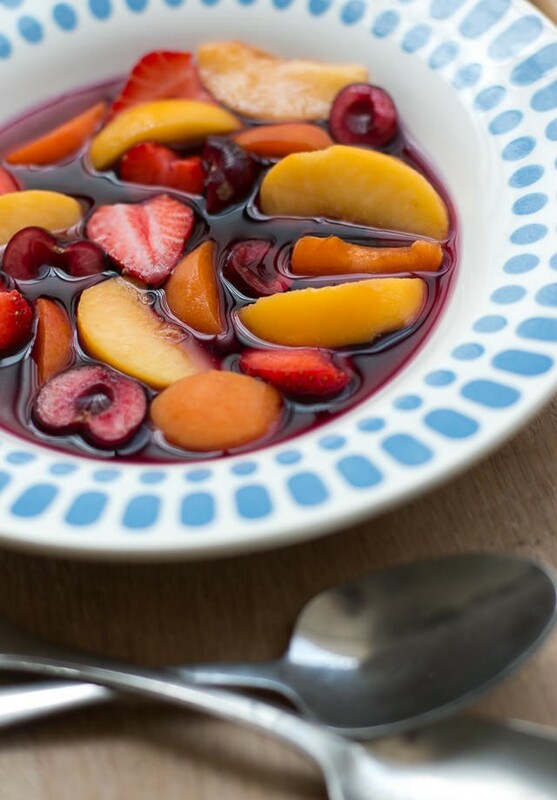 You can turn this into a delicious summer fruit soup by adding sliced peaches, nectarines, plums, apricots, pitted cherries and berries to the wine. For best flavor, let them sit in the wine an hour or so in the refrigerator and serve the fruit and wine very well-chilled, in icy cold bowls as well. You could also plunk, or plouf, a few ice cubes in the soup to make it extra chilly. Mine tasted good after a week of marinating. But you might want to taste yours a few days before and see if it’s to your liking. It may also take a little longer to get the flavors into the wine, depending on the whims on nature. Use a fruity, inexpensive red wine. The kind that comes in the jug or box is fine. Pinot noir or merlot are two varieties that lend themselves to this apéritif wine, if you’re shopping my variety (cépage). One could omit the peppercorns and add other flavorings, such as a cinnamon stick, allspice berries, a few cracked cherry kernels, star anise, a vanilla bean, and/or a few wide strips of lemon or orange zest. Note that this wine is quite strong so serve it with plenty of ice to dilute it.Update: A number of people in the comments asked me about using other leaves for this apéritif wine. I’ve used peach leaves but not any others. If you have questions or concerns about leaves that you have, I recommend checking with your local cooperative extension (or nursery) to determine if they’re suitable to use. 1. Rinse the leaves and pat them dry. Put them in a large jar that has a lid. 2. Pour in the red wine and vodka. Add the sugar and peppercorns, cover, and shake well to dissolve the sugar. Let stand one week, shaking the jar a few times once per day. The leaves will wilt into the wine after a day or so, so not to worry if they aren’t all marinating in the wine at first. 3. 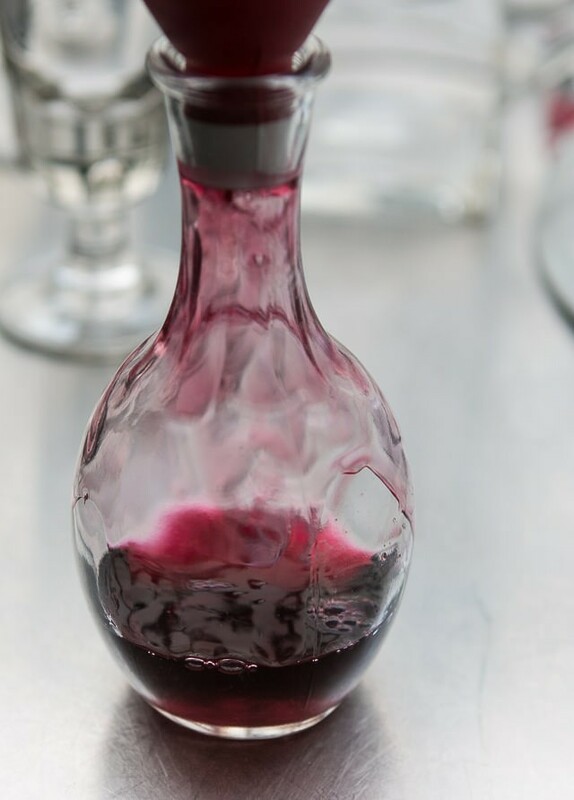 When ready, strain the liquid into a bottle using a funnel and a mesh strainer (or cheesecloth). Discard the leaves. 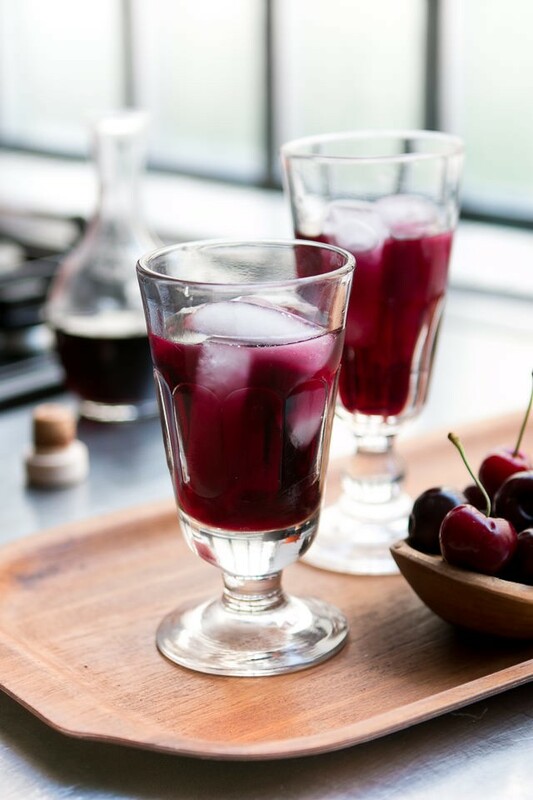 Chill the cherry leaf wine until ready to drink. Serving: Serve the wine in glasses with plenty of ice. Storage: The wine can be kept in the refrigerator for at least a year. Looks beautiful, but what does it taste like? Do the leaves impart a cherry-ness to the wine? Or add greenness? So share your fondue recipe, who doesn’t like fondue! I don’t understand where people get the idea that consuming a food or beverage in a certain way is “wrong”. Why can’t you just enjoy it the way you want? Is that a very American question? Here in Austria, it is very common to drink wine “g’sprizt” during the summer– watered down with mineral water and served with ice cubes, basically just like you describe drinking it in Corsica, just usually with white wine. In fact as far as I can tell that’s the only way you can order a drink and have some chance there will be ice in it. Beer is served cold, which some other people might think is verboten. Those people would probably horrified to learn that another common summertime drink here is a “Radler”, which is half orange or lemon “limonade” (kind of like sparkling soda) and half beer. Thanks for the post David. The cherries aren’t ripe here yet but I’ll have to try this recipe when that happens. And I might even add some ice! I think different people (and cultures) have a different relationship to wine. Some places it’s considered an “upscale” beverage while elsewhere, such as in France (and sounds like the same in Austria), it’s just considered a drink to many. There are lots of different types of wine: vin de table is meant for everyday consumption, but some people feel like that is a desecration wine. Many Parisians raise an eyebrow at ice in wine, even rosé, but in the south of France, they bring a big carafe of rosé filled with ice cubes, or with ice on the side. (Some people here in France don’t like chilled drinks and I’ve been served room temperature rosé, and once a slightly warm Sauternes, which should be at least cellar temp to cut the sweetness.) While you wouldn’t add ice or water to a very fine wine, people in the south of France do it, especially in hot weather. I think wine in the US is considered “upscale” because it’s priced substantially higher than wines in France and the difference in the ratio of price/quality is so different. You can buy really good wines in France for the same price as those on the bottom 2 shelves at Safeway. My favorite Radler is half grapefruit juice and half beer. Yum! This looks delightful! I may have to find an alternative leaf – no cherry trees in my immediate vicinity – but I’m really looking forward to it! Any suggestions? If you have access to a peach tree, and leaves, you can make vin de pêche! Not sure it would work with any other leaves, but I’ve made apéritif wines with both peach and cherry and they work well. Hmm, I know of an apricot tree… close enough? Just made vin de peche a few days ago using your recipe/method as I have for a few years now — I’m always pleased with the result. Further delighted to see this version using cherry leaves and PEPPERCORNS! and VODKA! Wow! Thanks for another exciting culinary adventure. And peppermint leaves? Do you think they work? It does to the Mojito!? 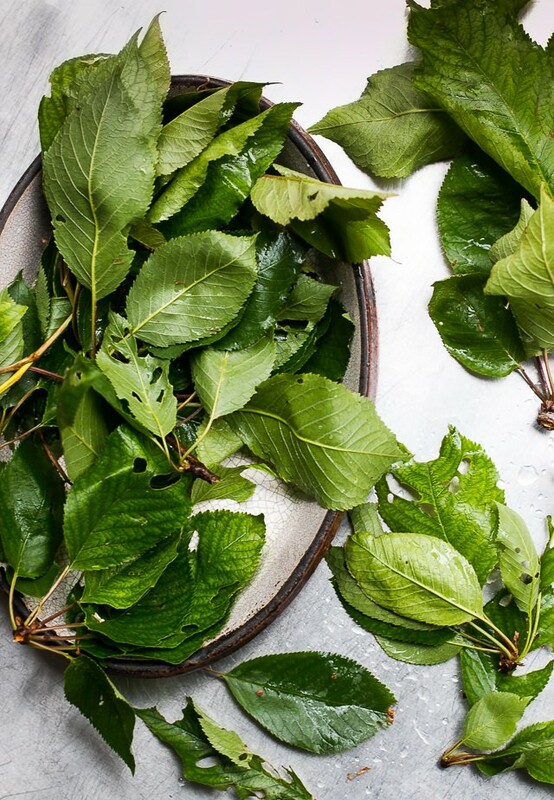 Were the leaves from a sweet or sour cherry tree? This looks pretty fun, but before taking the plunge I was wondering what kind of flavor the leaves lend to the beverage. I have never added tree leaves to food of any kind (as far as I can remember) so have no idea what to expect! The leaves add a slightly fruity, slightly almondy flavor to the wine. 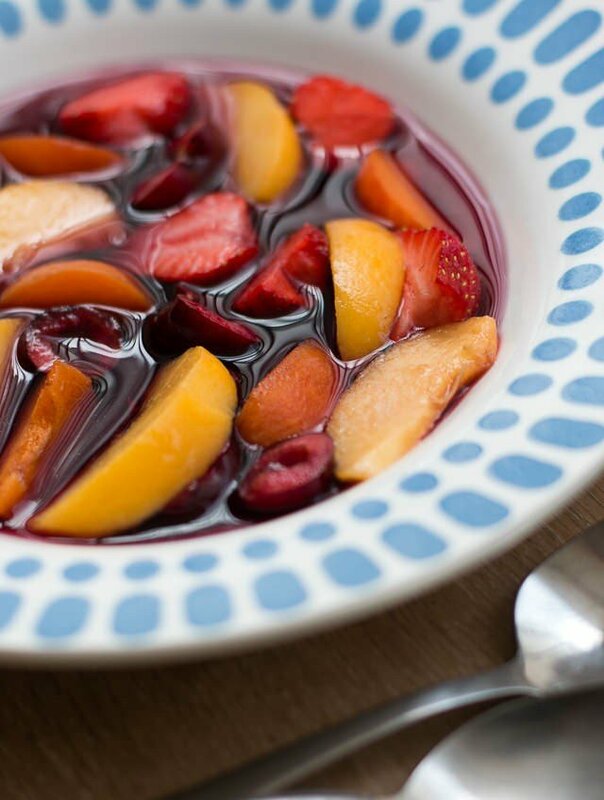 It compliments summer fruits very well, or is just good for drinking, over plenty of ice. I haven’t made this for ages! We call it guignolet here because the wild cherries are guignes. We usually use cheap rosé rather than red, and we used to buy 80% alcohol from the chemist till it was interdit — now we use vodka. I love the idea of using it for fruit soup! wait, you can’t get 80 proof plus anymore? I still can, I purchase it at gas stations in France and Luxembourg. In Lux it can go to 100%. Pharmacies aren’t allowed to sell it any more. You could get it “under the counter” for a while, but I’d feel bad exposing the local pharmacienne to possible prosecution. This has nothing to do with food, just to let you know that you can sell off your excess stuff perfectly legally: sign up at your Mairie next time they organize a “vide-grenier”. You’re allowed to sell your personal belongings twice a year. Be there early to sign up as places go fast. And be prepared for a little paperwork. I appreciate the way you sprinkle a bit of French vocab in these posts, especially the kinds of words that aren’t likely to pop up in most French courses. It’s a great resource for those of us who yearn to follow your lead and settle in France. I’m currently making vin de noix (walnuts need to be green and picked before the hard shell develops). Then, it will be vin de pêche (made with white wine). These were staples at my grandparents’ home in southwestern France. I’ll pack them in pretty bottles and they will make nice gifts at the end of the year. I can quite see the attraction of this but at the same time I also confess a hesitation to ‘cheap wine’ – my bottles always are in the 6-9 Euro or even higher, section. However, when we are in a ‘holiday camp mood’ somewhere with many others, I find the really cheap wine from 10l boxes quite lovely – and yeah, it’s usually hot and in a cheerful atmosphere! I have been following for awhile, but this post moves me to comment. Next week the cherries at the pick-ur-own farm will be ready and I am excited to try this out. The farm also offers apricots and plums throughout the summer, so I will be experimenting frequently. Thank you for the excellent idea. We have dandelion wine racking now! These are lively, informal, good community events. Oh for a cherry tree! I have been making this Vin d’orange for a number of years. It has become a “must do” for my sister. 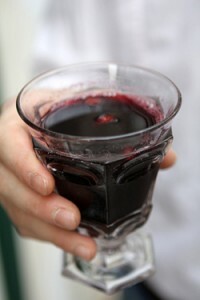 Some years ago I was in Bosnia and surprised that the locals added water to the red wine. Then I tasted the red wine and found it unpalatable without the water. 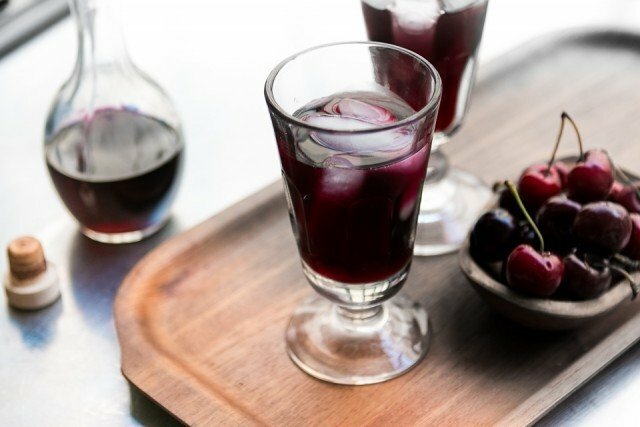 I made this in France based on your vin de peche post back in 2008, but used cherry leaves. It was so wonderful. I kept it through December. It went really well during the christmas season. Thanks for posting this- have to make it again! Neighbor has cherry trees, will be visiting today. As for “garage sales,” I guess this is why you can often find stuff just sitting out on the street for the taking in Paris. vive les gleaners…! I didn’t know cherry leaves could be used like this. Amazing…the fruit soup looks absolutely stunning! Love that the French use cherry leaves too, had only seen them used in Japanese cuisine before. Hi David, I have some photos to send to you, but don’t know how to do it on your blog….. Besides the fact fruit tree leaves add an almondy flavor is the thinness of the leaves important in making a home made fortified wine? I’m just wondering if lemon (using a white wine), bay, or even rosemary (say, coq au vin ingredients) would produce something drinkable. 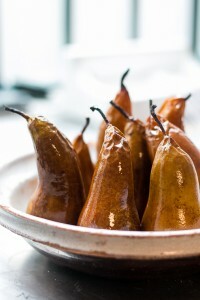 Thank you for your most wonderful blog and especially your incredible cookbooks. I’m having a luncheon (14) and I’m using a couple of your recipes from MY PARIS KITCHEN and READY FOR DESSERT. Your Gazpacho, lemon-pistachio Israeli Coucous. (Most favored is your Orange-Almond Bread Pudding…. that you have time or inclination to answer me but I can hope. my yard, mostly Satsuma plums. Good suggestions made by the latest review suggesting yogurt in the marinade. Enjoy your party – the food is going to be amazing. When I was traveling in Africa (Rwanda) a couple years ago I was bewildered to be routinely asked when ordering a beer in a bar or restaurant, “Warm or cold?” I’ve got to guess that it is a layover from more traditional warmed alcoholic beverages there (either Rwandan or possibly Belgian) or that some people just adapted to non-chilled beer due to lack of electricity. Either way, I thought it was interesting! Everyone’s got their own tastes, that’s for sure. Want all your old knives and boards! Will include guesthouse in the pays d’Auge for a weekend this summer! I promise you won’t regret! Looking at David’s photos here and in his cookbooks I now know where all those cafe au lait bowls and confiture jars went that used to be ubiquitous and now are not se easy to come across in France. How about a recipe for vin d’orange? The last time I was in France, the host at dinner pulled an earthenware jug out of his basement and served us vin d’orange. To die for! Please, please spread the word about ice in wine to America. One of the problems I have living in Atlanta is that people insist red wine should be served at room temperature. Well, room temperature in Georgia in the summer is close to unbearable. And I’m very distressed at being served a glass of hot wine all the time! I know what you mean Lis. Sometimes in the summer the whites or rosés need just a little ice cube to get them to that satisfying temperature. 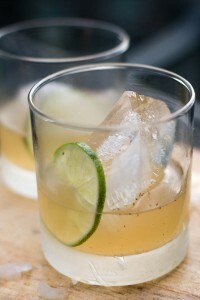 This drink sounds terrific David and a great party addition and conversation starter. Thanks as always! Hello, I am keen to make your cherry leaf wine…..I have a small cherry scrub in the garden so I will try my hand at making your wine…..But I will check with the leaves in your photo and the leaves on my scrub to make sure they are the same…..Thanks…Querino de Freitas…..
paule: Un peu de deux! Lis: Yes, most red wines are supposed to be served at cellar temperature (although not all). In France, often Brouilly and similar wines are chilled. Guy: My recipe for vin d’orange is in my book, Ready for Dessert. kayo: People do just put stuff out on the sidewalks in Paris. There are a couple of benevolent organizations that you can donate to (and some have pick-ups once in a while in some of the apartment buildings) – but yes, people do “glean” a lot of things off the streets of Paris. And you often find people (not necessarily homeless people) rifling through garbages, looking for things. My partner said that’s Très parisien – who knew? Hi I just did some research and there’s some evidence that wild cherry (what I have in my backyard) leaves contain cyanide and can be toxic. True or false? Should I use cultivated cherry leaves? I will be trying this interesting recipe soon. I have a large Rainier cherry tree in my back yard that I planted 20 years ago at my home 40 miles outside of Seattle. I have friends in Eastern Washington who have Apricots. Will the leaves from their Apricots work well also? I have a wild cherry tree would the leaves work from that? sorry only just seen previous query! mary + Chris: If you have doubts about your leaves or tree, ask your local cooperative extension. They’ll know best for your area. Robi: I don’t know as I’ve not tried it. If you do, let us know how it turns out. Sounds splendid. I’m all for taking summer fruit soup for my work lunches. It would make the afternoons so much better! it’s sort of the ”herbal medicinal in small quantities, poisonous in large quantities” principle..
Yum! It reminds me of a delicious red wine-based bottled aperitif called Madame Rouge made by a local Auckland winery, only that uses premium red wine and is consequently eye-wateringly expensive. I like the price tag of yours better, and had never thought of making something like that myself! David, we have an ornamental cherry (not fruit-bearing). Any idea if those leaves would work? I’ve only used cherry leaves from trees with edible cherries to make this. I would check with my local cooperative extension to verify if yours are usable or not. I’ll try this as soon as I can! Thank you for the idea (I too hate to get rid of useful stuff). And off-topic, but do you know what can I do with whipping cream that is two weeks past the expiration date? can I make this a day in advance or will the wine get too oxidised? In Ancient Greece and Israel wine was described as often diluted with water! There’s no such thing as a yard or sidewalk sale here in my corner of Spain. They look down their noses at used items…at least they did pre-crisis but things are changing. People still don’t have sidewalk sales but second hand shops are popping up like mushrooms. People still throw out perfectly good stuff and I have to fight the gypsies over the choice items. Things I have picked up in or next to the dumpsters: furniture, cool plant pots, plants, a pressure cooker, a great print of Picasso’s Guernica, plant stands, et cetera. Just like when I lived in Seattle my only restriction on used crap is underwear but here in Spain new underwear is dirt cheap. Oh a French version of Cherry Bounce! Sounds yummy. This looks stunning. Can’t wait to try it with friends! This sounds so delightful and refreshing! I absolutely agree with you, cold is fine, dilluted with ice mmm….. Drink a Dubonnet! I never knew you could use the leaves for anything edible. I tried leaving a message on the Salted Caramel Ice Cream page but don’t see a place for messages. I made the ice cream this weekend and it was delicious. Our spoons, however, developed a coating as we ate the ice cream. From what I read in the comments you had said that it was caused by overchurning. That sounds right, however, my (cheap) machine stopped churning after a couple of minutes (the custard freezes to the sides of the bucket shortly after being poured in). Is it still possible that it was overchurned? Thanks for posting this. It’s such a fun process and incredible transformation for cheap wine. Because I had some extra on hand, I added three crushed cardamom pods. I highly recommend it. Their floral nature bridged the wine and cherry leaves. Santé! We use to make ‘sorbet russe’: a simple lemon sorbet infused with blackcurrant leaves. Resulting in having in a white sorbet tasting deep purple. That makes me wonder if this cherry wine will also work with blackcurrant leaves. You will have to adjust the extra flavours of course, but I think I will stick to the peppercorns. I will definitely try! Thank you! You do have to be careful using peach or cherry leaves or pits for flavoring– they do all contain a bit of cyanide and in strong doses can make you quite ill. Children, especially, should not eat or drink anything flavored with these botanicals. Old English and US cookbooks used to recommend crushed peach or cherry pits and leaves for flavoring, but stopped when people overdid it and got ill. My dad used to tell me stories about a woman in his small town who nearly died from her peach pit enhanced peach preserves. Not saying don’t make the recipe, just saying being aware that the almond flavor is a poison that should be consumed in small portions!